"This recipe is from the 1920's. It was my sister in law's great grandmother's. I have tried many, but keep coming back to this one. I hope you enjoy it as much as my family does!" In a small saucepan over medium heat, stir together the sugar, cornstarch, salt, mustard, water and vinegar. Bring to a boil and cook, stirring, for 1 minute. Remove from heat and let cool. In a large bowl, combine the green beans, wax beans, kidney beans, onion and green pepper. Pour the cooled dressing over all and toss to coat. Best if marinated for at least an hour before serving. Yummy! A mayo-free salad perfect for large family gatherings and picnics. This was excellent. Just the right amount of tang and sweet. I used Great Northern Beans instead of wax beans. My one year old loved it! 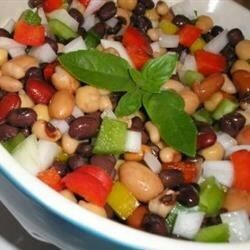 This is a very good basic 3-bean salad. I, too, cut the sauce in half and it wasjust fine. It does taste better after marinating overnight. Excellent recipe that tastes better and better the longer it marinates. My husband and I both really enjoyed it. If you want fast and tasty...this is it! I have made this over and over again and the kids love it! Easy, quick and so good! Although I think I had enough dressing for about two batches and just used 6 cans of beans instead.